My mom makes a fantastic sweet potato casserole that is always the hit of Thanksgiving. It's a combination of pureed sweet potatoes, butter and brown sugar topped with marshmallows and baked until golden brown. For this dessert I've taken the components from her casserole and broken them down into a modernist dessert. I take crispy sweet potato chips and top them with a fresh orange and brown sugar marshmallow. Then I finish it with a drizzle of molasses for extra flavor. 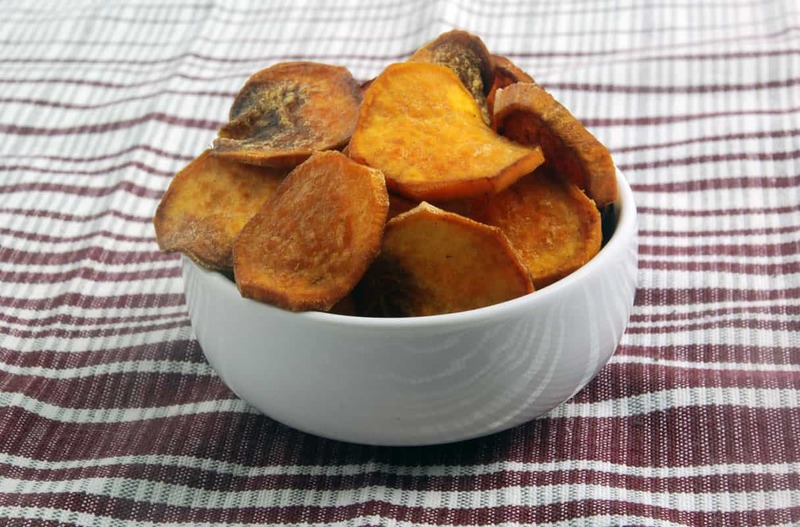 The marshmallow and sweet potato chips can be made up to a day ahead of time. Even though they won't replace my mom's casserole for me, they're still a hit at every party! If you would like more information about the modernist techniques, ingredients, and equipment used in the Mom's sweet potato casserole bites recipe you can check out the following. Prepare a 33mm x 23mm (13" x 9") baking pan by spraying it with Pam. Combine the cornstarch and powdered sugar and sift some of the cornstarch mixture in the pan. While the gelatin is blooming, combine the ingredients for the syrup in a sauce pan set over medium-high to high heat. Stir it lightly until the sugar is dissolved and then leave it alone while it heats. Cook the syrup until the temperature reaches 110°C to 116°C (230°F to 240°F). Whip the marshmallow mixture until it has tripled in volume, it should take 8 to 15 minutes. When the marshmallows have almost been fully whipped, add the orange extract and make sure it is fully incorporated. Dust a cutting board with the cornstarch mixture. Turn the marshmallows out onto the cutting board and cut into the shapes you want. Coat the shapes with the cornstarch mixture to prevent them from sticking to each other. You can store the marshmallows for several days in a sealed container. 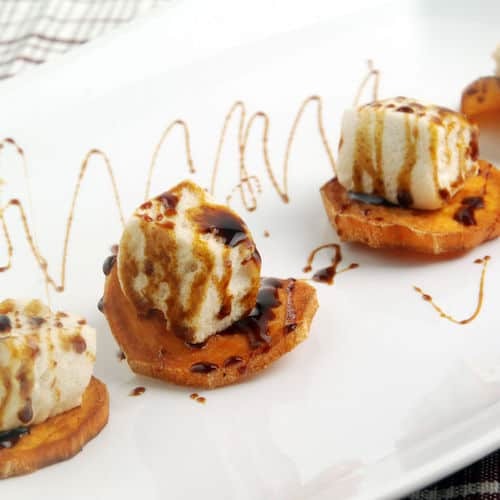 Place a sweet potato chip on a plate and top with a square of marshmallow then drizzle some molasses on top. You can also heat the assembled dessert in a low oven until warm. Mom's sweet potato casserole bites are a take off from an old family recipe. 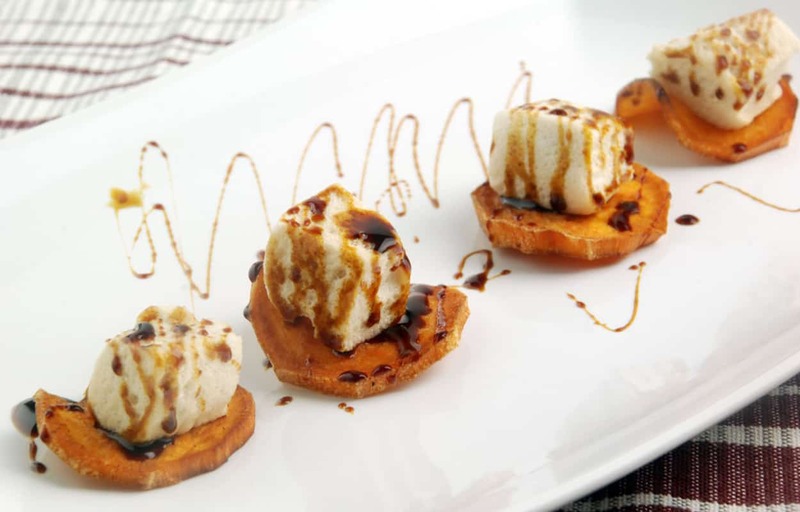 This modernist cooking twist tops sweet potato chips with gelatin-based marshmallows with a molasses drizzle! A party hit!